Toxicogenomics is the integration of genomics to toxicology. This technology is a powerful tool for collecting information from a large number of biological samples simultaneously and thus it is very useful for large-scale screening of potential toxicants. 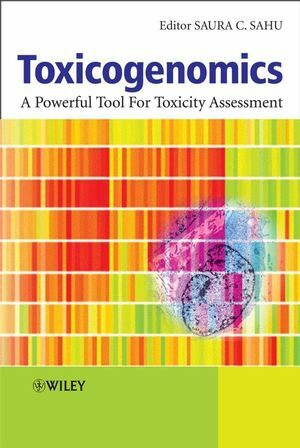 Toxicogenomics: A Powerful Tool For Toxicity Assessment is an essential resource for research scientists currently engaged in toxicogenomics, and will also be of interest to researchers working in toxicology, genetics, medicine, pharmacology, and food sciences, and to regulators and risk assessors of drug, food, environmental and agricultural products. Dr. Saura C. Sahu, Research Chemist, Division of Toxicology, Office of Applied Research and Safety Assessment, Center for Food Safety and Applied Nutrition, US Food and Drug Administration. Dr. Sahu is the US Editor for the Journal of Applied Toxicology and the editor of Hepatotoxicity (Wiley, Dec 2007). 1. Mechanistic toxicogenomics: Design and analysis of microarray experiments (Kirstin Meyer, Susanne Schwenke and Johanna M. Beekman). 2. Analysis and interpretation of toxicogenomic data: Biological responses to low, environmentally-relevant doses of toxicants (Julia A. Gosse, Jennifer Davey, Thomas Hampton and Joshua Hamilton). 3. Principles of data-mining in toxicogenomics (Yoko Hirabayashi and Tohru Inoue). 4. Design issues in toxicogenomics studies: The application of genomic technologies for mechanistic and predictive research (Woong-Yang Park, Lian Li and Daehee Kang). 5. Sources of variability in toxicogenomic assays (Karol Thompson, P. Scott Pine and Barry Rosenzweig). 6. Key aspects of toxicogenomic data analysis and interpretation as a safety assessment tool to identify and understand drug-induced toxicity (Antoaneta Vladimirova and Brigitte Ganter). 7. Toxicogenomics as a tool to assess immunotoxicity (Kirsten Baken, J. Ezendam, J. Pennings, R. Vandebriel,and H. Loveren). 8. Toxicogenomics and ecogenomics for studying endocrine disruption and basic biology (Taisen Iguchi, Hajime Watanabe and Yoshino Kata). 9. Gene expression profiling of transplacental arsenic carcinogenesis in mice (Jie Liu, B. Diwan, R. Tennant and Michael Waalkes). 10. Characterization of estrogen active compounds and estrogenic signaling by global gene expression profiling in vitro (Stephanie Simon, Kathleen Boehme, Susanne Schmidt and Stephan Mueller). 11. Escherichia coli stress response as a tool for detection of toxicity (Arindam Mitra, Nabarun Chakraborti and Suman Mukhopadhyay). 12. Toxicogenomics in vitro: A powerful tool for screening hepatotoxic potential of food-related products (Saura C. Sahu). 13. Toxicogenomics approach to drug-induced phospholipidosis (Hiroshi Sawada). 14. Use of toxicogenomics as an early predictive tool for Hepatotoxicity (Laura Suter). 15. Nutrigenomics: The application of genomic signatures in nutrition-related research (Stamotis Theocharis and Elisavet Gatzidou). 16. Application of toxicogenomics in drug discovery (Michael Liguori, Amy Ditewig and Jeffery Waring). 17. Natural products from medicinal plants and risk assessment (Leila Chekir-Ghedira). 18. The development of a metabonomic-based drug safety testing paradigm (Muireann Coen, Elaine Holms, Jeremy Nicholson and John Lindon). 19. Potential Uses of Toxicogenomic Biomarkers in Occupational Health and Risk Assessment (Paul A. Nony). 20. Usefulness of toxicogenomics in the regulatory environment (Daniel Casciano). 21. Toxicogenomics for regulatory use: the view from the bench (P. Ancian, S.Leuillett, S. Artaud, J. Jegard and Roy Forster). 22. Perspectives on toxicogenomics at the US Environmental Protection Agency (Karen Hamernik, Kenneth Haymes, Susan Hester and Thomas McClintock).